When visiting a big city like Barcelona, be it for business, pleasure or a big special event, it’s a good idea to have a list of car services handy before you arrive to be sure that, no matter the occasion, you know who to call for a ride. Even if all you need is a ride from the airport after a long flight overseas, there is a Barcelona limo service that can serve your needs. There really is no better way to travel through a foreign land than in your own private car with few distractions and a chauffeur who is there to serve you and you alone. Here are some Barcelona limo services to check out while planning your trip to the city. HummerBCN – If you will be visiting for a special occasion and want a fancy ride around town in a stretch hummer or party bus, HummerBCN is your best shot. These vehicles are all completely stocked with party lights, comfy seats, plenty of bar space for your festivities, and great windows through which to see the sights while you cruise through town, either to your destination, or just to see the city lights. Barcelona Airport Transfer – Offering the standard Barcelona limo service to and from the airport, Barcelona Airport Transfer has easy online booking that will make your trip go all the more smoothly. Taking special care to always be safe, punctual and providing the utmost comfort in their line of Mercedes limos ranging from sedans to ten passenger vans, you’ll love how easy these guys make it. Diagonal Mar Limousines – While they are happy to provide the typical airport transportation, Diagonal Mar is especially well known for their private tours of the city. You can either take a comprehensive sightseeing trip consisting of about four hours of visiting some of the city’s most famous sites, or you can choose to take more detailed tours of certain destinations like Montserrat or Penedés. Can you imagine a more relaxing way to see the sites than to be chauffeured through the city’s busy streets in a luxury vehicle by a friendly, English-speaking local? We can’t! This is an outstanding Barcelona limo service that also does private shuttling to and from big sporting events. Chofer-Car – This is a global company known for excellence, and is therefore a great option as a Barcelona limo service. While they are pleased to provide basic transportation needs, they too specialize in private tours, special events, and customized transportation needs. Whether you’re in need of a chauffeur for an extended business trip, or to rent a coach bus for a tour or special occasion in the city, Chofer-Car is the place to call. Barcelona is a great place to explore on foot, bicycle, or public transportation, but sometimes your trips to the city won’t allow for these leisurely luxuries. When in town on business or for a busy special occasion, be sure to use a Barcelona limo service for the most convenient, comfortable, and dependable mode of transportation around town. Let someone else do the driving, so you can focus on the task ahead! The end of summer in Catalonia is a time for celebration, which has been the tradition since La Mercè Barcelona began back in 1902. Known worldwide as the city’s largest street party, people travel from far and wide to partake in the five days of festivities designed to celebrate Catalan culture and the cooler days ahead. If you have yet to experience the events and energy at La Mercè Barcelona, perhaps this will be your year! Though the official dates have yet to be announced, you can be sure that it will take place around September 24th as it does every year. Named for the patron saint of Barcelona, Mercè who, as legend has it, blessed the city on many occasions to protect it from wars and plagues, is the cause for celebration when the end of September rolls around each year. At the turn of the century, when pope Pius IX declared the Virgin of Mercy the patron saint of Barcelona, he had many festivities planned in her honor, which were held throughout the city. In 1902 those festivities were organized into an official festival, which has been celebrated each year since, much to the excitement of both Catalonians and the many visitors to our beautiful city. Castellers – While waltzing down the street during La Mercè Barcelona you may stumble upon a human tower reaching stories above ground! Don’t be alarmed, the Castellers, as they’re called, are well trained performers who aim to show the Catalonia spirit of unity through this performance art. It is a tradition that has been around as long as the festival itself. Head to the Gothic Quarter during the festivities to Plaça de Sant Jaume and you’ll surely catch one of their memorable towers. Correfoc – Known as the procession of the fire-breathing dragons, this event takes place along the Via Laietana as dusk sets in. The dragons, who do indeed breath fire in the form of fireworks and sparklers, are accompanied by scary looking devils and mythical monsters marching through the streets and give everyone a little frightful excitement. If you do plan on attending this wonderful spectacle be sure to wear clothing that you won’t mind being damaged by sparks, as well as glasses or a hat to protect your eyes. 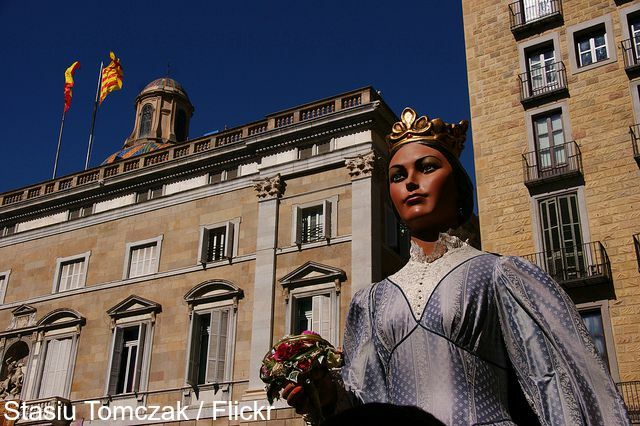 Gigantes – Don’t miss this chance to see the Catalan monarchy of old march through the streets. No, not real royalty, but giant costumed performers who dance to the accompaniment of drummers and flutists. If you have yet to experience the wonders of La Mercè Barcelona it is nothing short of a once in a lifetime experience. Not only will you get a taste for authentic Catalan culture with some of its rich history mixed in, but September is undoubtedly one of the most beautiful times of year to visit Barcelona. The summer heat is subsiding, while that temperate Mediterranean fall sweeps in for a few months of paradise. This trip could really be a dream come true! August in Barcelona is one of the busiest months of the year ensuring many exciting activities, beautifully warm Mediterranean weather, and visitors from around the world with whom to mingle. Between the beaches, festivals, and arts to enjoy, the end of the summer ends up being an ideal time to visit this Spanish city and take in the sites and culture, be it on a European family adventure, or the backpacking trip of a lifetime. Though Catalonians have long been known to take month long vacations during the month of August, visitors can be sure to find most of the businesses open. About 10 percent of the shops and restaurants will be closed as various families head out of town during the warmest and busiest month of the year – a tradition that undoubtedly adds to the charming and hospitable nature of the city’s many family-owned businesses. Here are some of the things to look forward to during August in Barcelona this year. This little-known festival takes place throughout the Sants neighborhood, featuring unique cultural attractions that celebrate the history of the families who settled this neighborhood centuries ago. This summer concert series takes place throughout the city at different venues, featuring many Latin musicians along with a mix of many other genres. Starting in July and continuing through early September, San Miguel Mas i Mas concerts make for a great evening out on the town. Throughout the month of August on Tuesday and Thursday evenings at the Centre de Cultura Contemporania de Barcelona, a series of films are screened on the rooftop patio. This great space has both a restaurant and bar and the movie nights tend to fill up quickly so be sure to get there early for a seat. The Circuit Festival is one of the largest LGBT gatherings in all of Europe. It offers 12 days of incredible parties and events throughout the city including a day at the water park, beach parties, documentary film festivals and tons of sporty fun like longboard outings and yoga sessions. Thousands of people from around the world come out for this wonderful celebration of LGBT culture! This neighborhood festival is one of the oldest in the city, with residents working year round to plan a fun festival in which locals and visitors alike come to appreciate age old Catalan culture. The main attraction are the streets and shops that get transformed by residents in a decorating competition that will shock you as you enter imaginary worlds like outer space and Jurassic Park. Be sure to check out Festa Major de Gracia in the evening to see these transformed worlds all lit up. August in Barcelona is bound to be a great time, whether you’re looking for a relaxing time or a great party. While the end of the summer is typically a busy time for tourists, it also ensures that there is plenty to do for all interests. 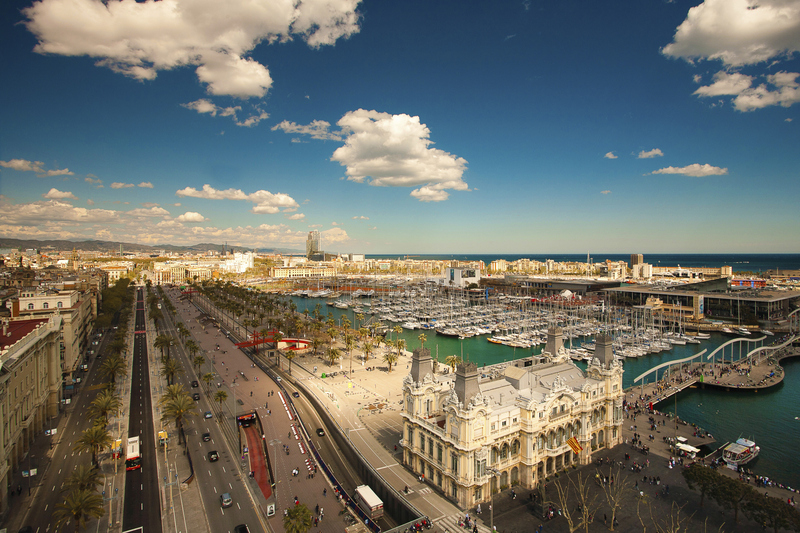 If you’re considering a European vacation this summer, make it August in Barcelona! Circuit Festival Barcelona Will be Here Soon! One of the city’s biggest international festivals is right around the corner, much to the anticipation of the LGBT community worldwide. From August 5th through the 16th, people from around the world to congregate in our beautiful city and celebrate a facet of culture that has long been in need of more diverse gathering options. Circuit Festival Barcelona answers that need offering a 12-day holiday of enjoying the sunshine on the beach, around the city, and the clubbing scene at night. Barcelona is the ideal international meeting point for this gathering of the LGBT community, and Circuit promises to be a safe and fun upbuilding experience! Circuit Festival Barcelona tickets can be purchased ahead of time either for individual events or for the entire event. Single event tickets range from 25€ to 75€. The All Access Pass will give you free priority access to all of the events at a 50 percent discounted rate. If you are looking forward to attending most of the events, this is a great option for you. The Pass also comes with a 10 percent discount at all the local shops that collaborate with the festival, four free entries at one of the DIR GYMS Barcelona, as well as festival swag! One of the festival’s most famous and fun events is the Water Park Day, which is known to be the biggest open-air gay part in all of Europe. This fun day in the sun will take place on August 11th starting at 10 am and going all night! Enjoy water games and rides, live music and performances, and thousands of people gathering to celebrate the LGBT community! Circuit Festival Barcelona is one of the events of the year in the city, and a great reason to finally take that trip to this ideal Spanish destination. Come enjoy the Mediterranean atmosphere, and the city’s rich modern culture!